Beautiful and brainy Texas attorney Sharon Hays must stand alone against mobsters, political corruption, and cover-ups when she discovers key evidence that could prove a man on death row innocent of killing his socialite wife. But little does she realize that the real killer still prowls in the shadows - and will stop at nothing to silence her! 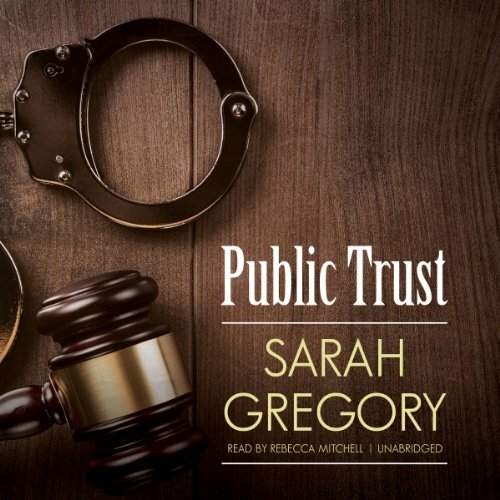 Public Trust is my favorite pure courtroom suspense novel on Audible. It is the second novel in the Sharon Hays series. Sarah Gregory, aka AW "Bill" Gray wrote a series of 4 stunning courtroom mystery novels featuring defense attorney Sharon Hays. From memory they are, in order, Self Defense, Public Trust, The Best Defense and finally Capitol Scandal. I listened to the 3rd, 4th, 1st and 2cd, in that order. I mention this because i stumbled into The Best Defense and loved the main character enough to buy the sequel. Then I learned Self Defense and Public Trust were written by Gray under the name Sarah Gregory, and of course I had to finish the series. Each book stands strong on its own. Public Trust has remarkable characters, outstanding courtroom drama and is a full circle revenge story as well. It is read by Rebecca Mitchell, who delivers a remarkable performance. That, my friends, is the perfect combination. If you haven't discovered this author, you are in for a real treat. I have listened to over 1300 books on Audible, most of them in the Mystery genre. I consider AW Gray's works on the same level as Jo Nesbo, Michael Connely, Alders-Olsen and James Lee Burke and Don Winslow. I have stated before his Bino series is my favorite on Audible. By all means buy this book! You will not be disappointed!